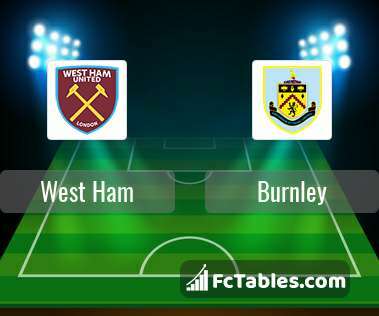 Match West Ham-Burnley Premier League the fixture is set to kick-off today 15:00 on London Stadium. Refereee Roger East. Team West Ham is located in the middle of the table. (14 place). West Ham in 5 last matches (league + cup) have collected5 points. From 3 matches can't win a match. The best players West Ham in Premier League, who scored the most goals for the club: Marko Arnautovic 4 goals, Andriy Yarmolenko 2 goals, Felipe Anderson 1 goals. Most goals developed: Marko Arnautovic 1 assists, Felipe Anderson 1 assists. Injured players West Ham: Winston Reid, Andy Carroll, Manuel Lanzini, Carlos Sanchez, Jack Wilshere, Andriy Yarmolenko. The match will not occur Mark Noble because they are suspended (cards, etc.). Team Burnley is located in the middle of the table. (15 place). Burnley in 5 last matches (league + cup) have collected7 points. From 3 matches can't win a match. The best players Burnley in Premier League, who scored the most goals for the club: Ashley Barnes 2 goals, James Tarkowski 2 goals, Sam Vokes 2 goals. Injured players Burnley: Ben Gibson, Stephen Ward, Nick Pope. Direct matches: West Ham won more direct matches. 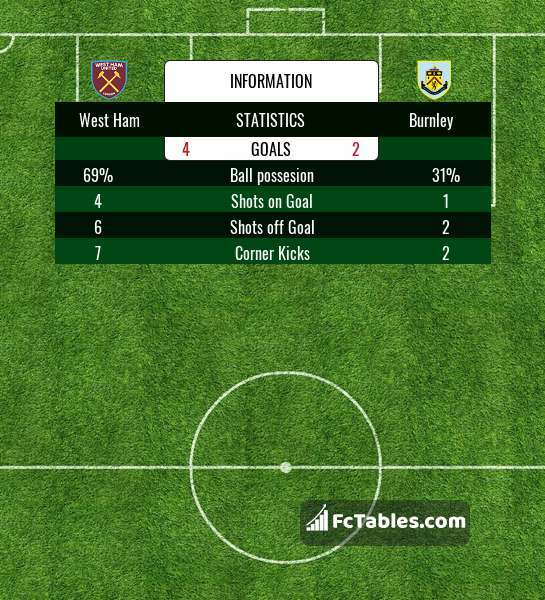 West Ham won 9 matches , Burnley won 3 direct matches, was a 4 draws. In 9 matches the sum of the goals both teams was greater than 2.5 (Over 2.5), and 12 matches teams scored more than 1.5 goals (Over 1.5). In 10 matches the both teams scored a least one goal (Both teams to score).